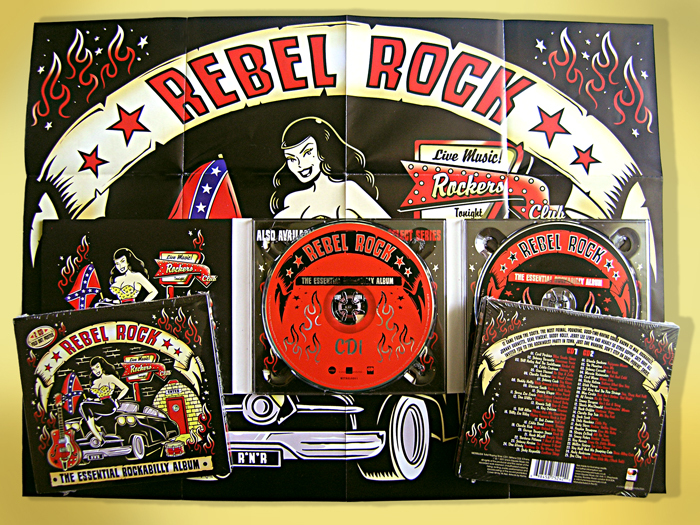 The brand new compilation album "Rebel Rock" edited by Union Square Music London, is now in our hands. This fantastic compilation album includes a great selection of rockabilly hits from legendary artists such as, Jerry Lee Lewis, Johnny Cash, Gene Vincent, Carl Perkins, Wanda Jackson, Buddy Holly, to name a few. Each of these fabulous titles are packed in a six-panel digipack and comes with a collector 24 page full color fold-out poster from cover design. It will be released on July, 2011. We'll keep you posted! Ya tenemos en nuestras manos el CD recopilatorio "Rebel Rock" editado por Union Square Music en Londres. Este fantástico CD recopilatorio incluye una buenísima selección de temas rockabilly de los mejores músicos, verdaderas leyendas del Rock and Roll de todos los tiempos. Artistas de la talla de Jerry Lee Lewis, Johnny Cash, Gene Vincent, Carl Perkins, Wanda Jackson, Buddy Holly y un largo etc. El recopilatorio Rebel Rock se compone de 2 CD con 25 canciones en cada uno de ellos e incluye también un poster del diseño de la portada. Una edición de lujo en formato Digipack. Podréis haceros con uno de ellos muy pronto, en Julio de 2011. 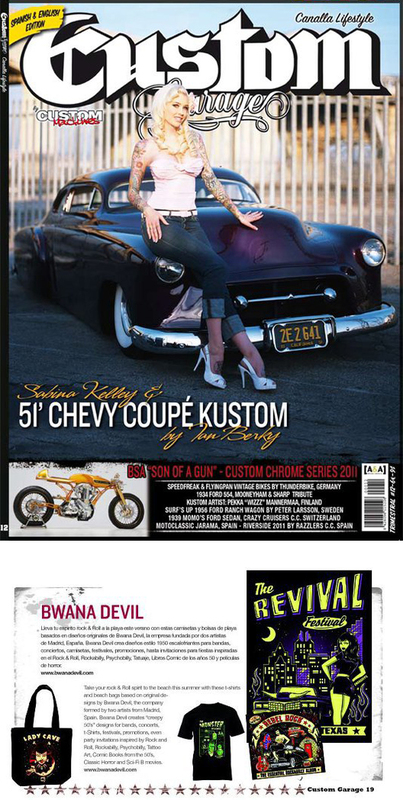 Many thanks to Custom Garage for the great mention in the international Custom Garage Magazine from Spain. Don't wait any longer and get issue 12 out now! 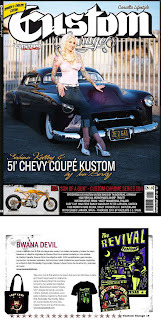 A fantastic magazine dedicated to kustom kulture. Muchisimas gracias a Custom Garage por el articulo dedicado a BwanaDevil en el ultimo numero de la revista de tirada internacional Custom Garage. No espereis mas y haceros con esta fantastica revista dedicada al mundo custom y canalla lifestyle! 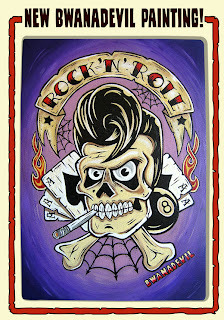 New Painting "Rock 'N' Roll" BwanaDevil now on sale! Acrylic on canvas measurements, 7,5 x 10,6 in. 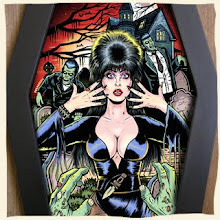 If you want this piece hanging on your wall, contact us sending an email to info@bwanadevil.com, and it can be yours. 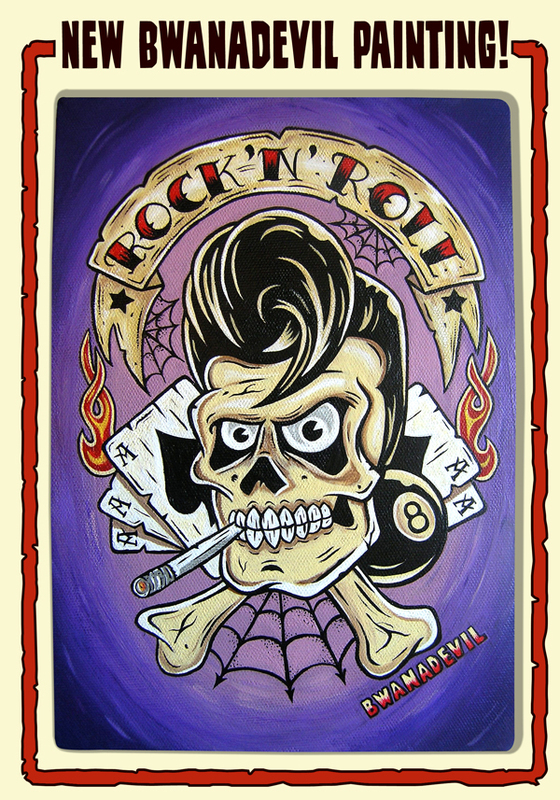 Nuevo cuadro "Rock 'N' Roll" BwanaDevil ya a la venta! Acrilico en lienzo, medidas 19 x 27 cm. Si estás interesado/a en colgarlo en tu pared contacta con nosotros a traves del e-mail info@bwanadevil.com , te informaremos de todos los detalles para poder hacerte con el. 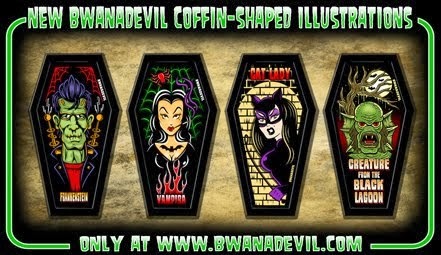 New design "Attack of the 50 Ft. Woman" for the new upcoming BwanaDevil B Movie collection. Soon available as prints and t-shirts! 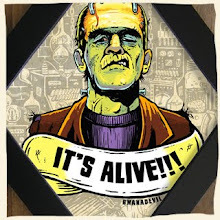 Nuevo diseño "Attack of the 50 Ft. Woman" el primero de la nueva coleccion BwanaDevil B Movie Collection. Muy pronto disponible como poster y camiseta!